According to the report, Gen. John Allen, the commander of U.S. and international forces in Afghanistan, has proposed to keep between 6,000 and 15,000 U.S. troops in the country following the end of combat operations in 2014. The plan would significantly differ from the way the U.S. approached its withdrawal from Iraq -- where America's complete withdrawal has often been blamed for instability. The New York Times reports that Gen. Allen is expected to submit his plan to draw down the 66,000 American troops who are currently stationed in the country as one of his last acts as top commander in Afghanistan. The WSJ report explains that according to the new plan, Americans who remain in Afghanistan after 2014 would conduct training and counterterrorism programs with Afghan soldiers. Any presence by Americans in Afghanistan past 2014 would require the approval of Afghan President Hamid Karzai, though Karzai likely wants U.S. troops to fall under the jurisdiction of Afghan court. Similar demands led to the complete withdrawal of U.S. forces from Iraq. According to Foreign Policy, the 10,000 troops that would remain Afghanistan undre this plan would be far fewer than the "25,000 troops that Pentagon water-cooler wisdom dictated," and "one-third smaller than what some military experts suggest the post-transition mission needs." The issue of how to draw down from Afghanistan has already become a political issue, the NYT notes, as Democrats prefer a steady reduction, while Republicans believe fast reductions could lead to further instability. 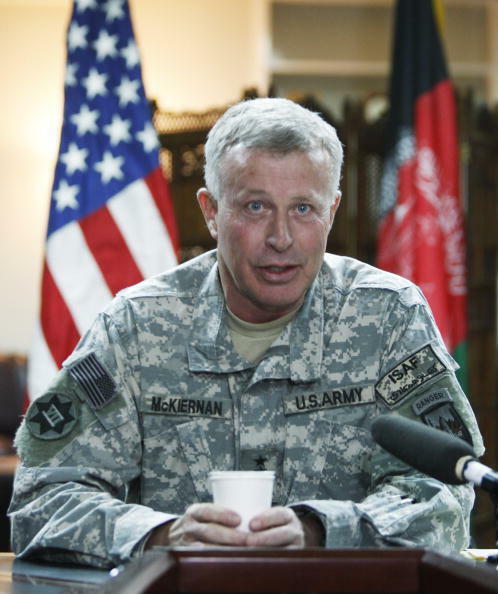 Gen. Allen is expected to submit several proposals on how the U.S. will approach post-2014 Afghanistan, though his future has recently come into question for his role in the email scandal involving Gen. David Petraeus.